“Tad’s Chic Dump”: The old neon sign glows amid the trees on the rugged edge of the Columbia River Highway in Troutdale, Oregon. 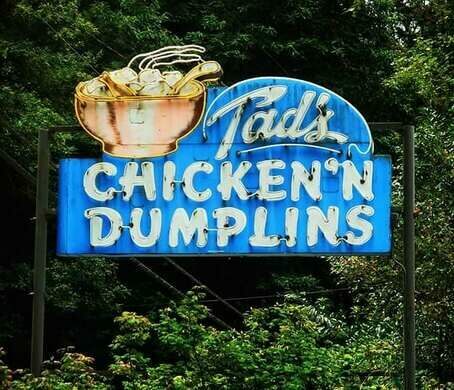 While half the letters spelling the name of Tad’s Chicken ’n Dumplins have stopped glowing, the restaurant itself is far from a dump. 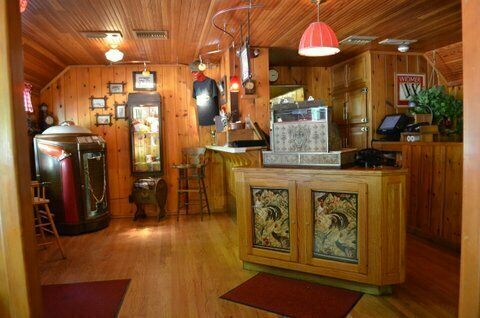 With a gleaming wood bar, homey red-checkered curtains, and a beautiful river view, Tad’s old-fashioned roadhouse is a welcoming watering hole for those wandering through the dense greenery along the Sandy River. Home to the only outdoor municipal elevator in the United States. 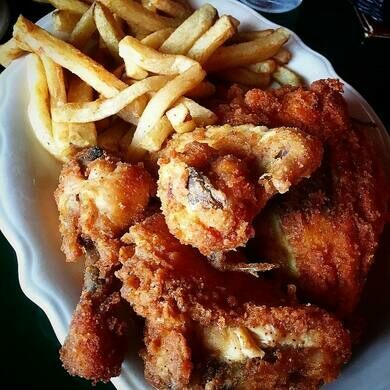 This legendary comfort food institution was founded in the late 1920s by “handsome Tad Johnson,” whom locals knew as “a rascal and a fisherman, (in that order).” Johnson did what any fish-loving gent of loose morals looking to attract fellow rascals would do: He opened a roadhouse selling fresh, local seafood. In the ’40s, Tad’s moved to its current location and added a jukebox, dance floor, and—most importantly for its current legacy—chicken and dumplings. 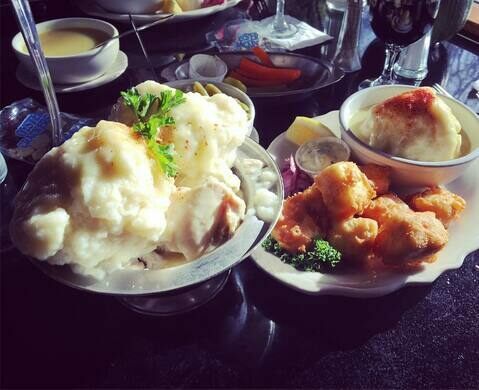 Now, locals and sojourners alike stop at Tad’s for filling food and peaceful outdoor scenery. 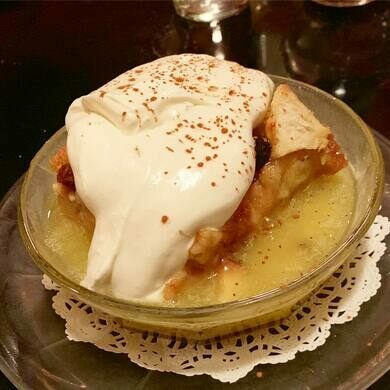 In the summer, families flock to the lower dining room, enjoying the river breeze from the open windows over menu classics such as local salmon, liver and onions, and the iconic chicken and dumplings. Consisting of chicken stewed until tender in a rich duck-fat gravy and doughy dumplings cooked in chicken broth, the dish has earned its reputation. Light eaters be warned: The fluffy, biscuit-like dumplings are truly enormous. 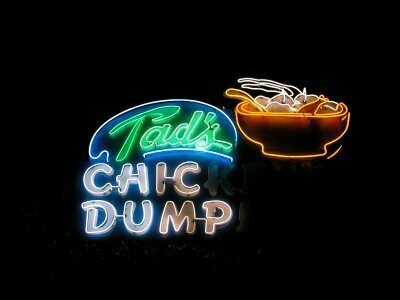 As for that neon sign, when half the sign first went out in the 1950s, locals loved the revised “Tad’s Chic Dump” so much that it became part of the establishment’s mythology. Rather than replace it entirely, the restaurant’s owners decided to compromise. Now, if you approach Tad’s from the west, on the Columbia River Highway from Portland, the sign reads “Tad’s Chicken ’n Dumplins.” Approach the restaurant from the east, however, and you’ll notice the sign’s playful reverse: A half-lit advertisement for Tad’s Chic Dump—just as the locals like it. The restaurant is open on weekdays from 5:00 p.m. to 10:00 p.m., on Saturday from 4:00 p.m. to 10:00 p.m., and on Sunday from 4:00 p.m. to 9:00 p.m. This plaque marks the spot where the first crossing guards helped get kids safely to school. Where British troops serving on the remote islands paid tribute to their faraway hometowns. This neon landmark has been posing this deadpan question to follicly-challenged Dubliners for over 50 years.